Meal planning and grocery shopping can be two very daunting tasks, and the last thing you want to think about on the weekends! Am I right? I am sure you have all been there... scouring Pinterst for an eye catching recipe, asking friends for recipe suggestions or worst just cooking the same meals week after week! Trust me, I know the frustration of meal planning! Well I want to help you take some of the frustration out of weekly meal planning and grocery shopping by sharing my grocery list and meal plans for the week! Each Saturday I will post my grocery list along with a list of meals I am planning to prepare that upcoming week! Some will be my own recipes that I will share with you during the week, others will be favorite recipes from around the web that I will link to! If the recipe is a new one of mine, I will let you know the day it will be published! Keep in mind I am cooking just for just 2 (Derek and myself)! After each meal we generally have about 2 servings left that I will eat during the week for leftovers (as most of my recipes serve between 4-6! 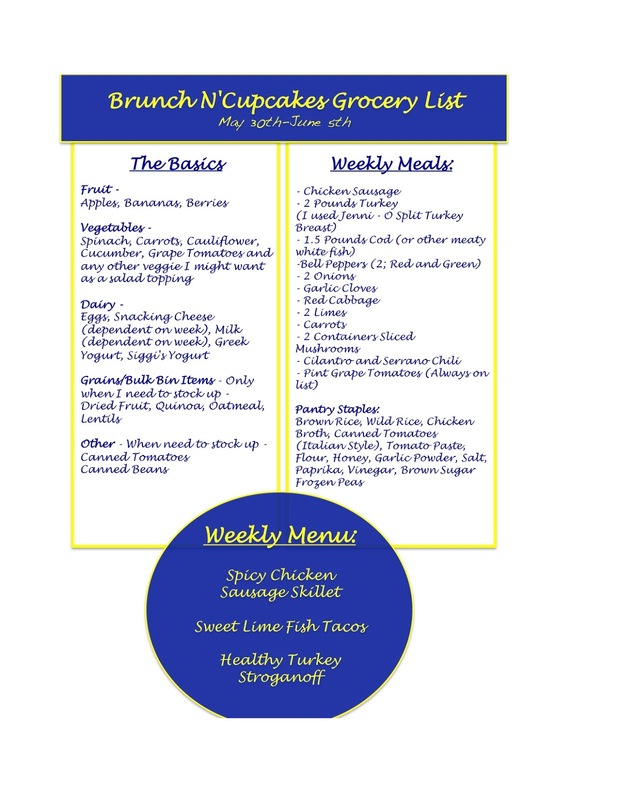 So let's kick off the inaugural weekly menu and shopping guide! Recipe is Live!!!! Check it out here! Note - I generally try to cook three times a week and then eat leftovers and or salads for the rest of the week! Most times I will cook Monday, Wednesday and then either Friday, Saturday, or Sunday (sometimes it is nice to start the week with leftovers from Saturday and Sunday)! Now let's talk grocery shopping! I have basic staples I buy on a weekly basis (think Greek Yogurt, Salad Veggies, things like that) and then my weekly meal essentials which are based on the recipes I will be cooking that week - below is my grocery list for the week including the ingredients for the above recipes!